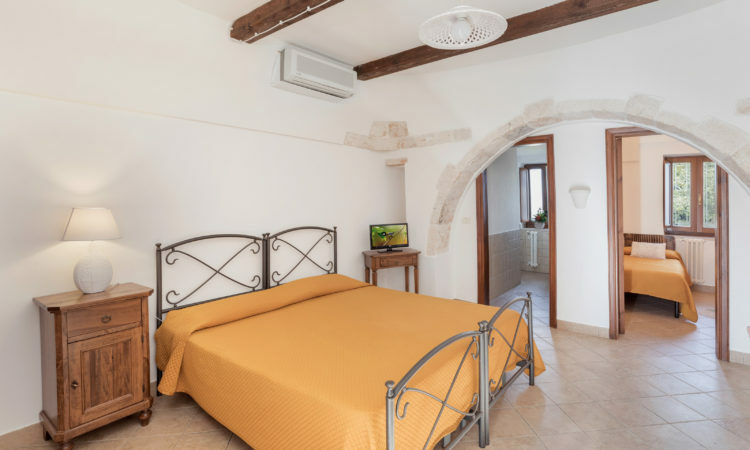 Alberobello old town is split into two quarters on two hilltops: Rione Monti and Aia Piccola, both National Monuments, whereas the trulli were acknowledged World Heritage by UNESCO in 1996. The Aia Piccola is the most beautiful trulli area. There are about 400 trulli dating back to 17th – 18th centuries. 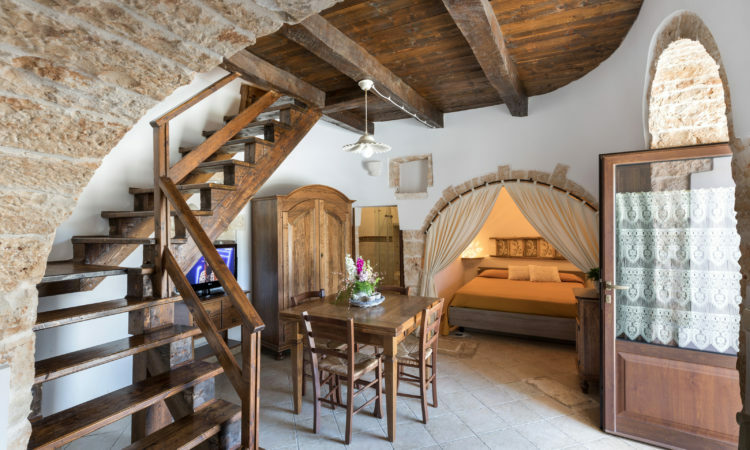 Here you can enjoy a heart-felt experience of Alberobello past. Alberobello, as a built-up area, dates back probably to the mid-fifteenth century. In 1481 King of Naples Ferrante D’Aragona granted Andrea Matteo Acquaviva, Count of Conversano, feudal rights and ownership of a largely uninhabited area of the Trulli Murgia. Count Andrea Matteo named this new territory Silva aut Nemus Arboris Belli (today Alberobello) and ordered people from neighbouring towns to settle there. By the year 1525, forty families had settled in this new territory. In 1620 Gian Girolamo II encouraged a bigger growth of the Silva and an inn, a mill, a public oven and a butcher shop were built. In spite of all that, the settlers in the Silva were unhappy, because of Gian Girolamo’s cruelty and ambition, who dreamed his Silva to be independent of the Reign of Two Sicilies. To this purpose he kept his subjects virtually as prisoners. They had no legal rights whatsoever. He forced the peasants to build stone houses without any binding material in order to make them appear as temporary accomodation. As a matter of fact, according to a law known as Prammatica de Baronibus, the birth of any new built-up area required the payment of a yearly tax. They say that the houses were partly or totally demolished in case of royal inspections. Reconstruction could be quickly carried out by peasants after inspectors left. Alberobello gained political freedom from feudal despotism only in 1797, when it was officially declared royal town. The word trullo probably comes from the Greek word “tholos”, meaning dome, or from the Latin words “turris” or “trullum” meaning tower. The origin of their oddly-shaped stone design is still uncertain. They can be considered remarkable examples of house deriving from prehistoric building techniques. Some historians compare them to similar buildings spread all over the Mediterranean area, in particular Spain, Turkey, Greece and Africa. 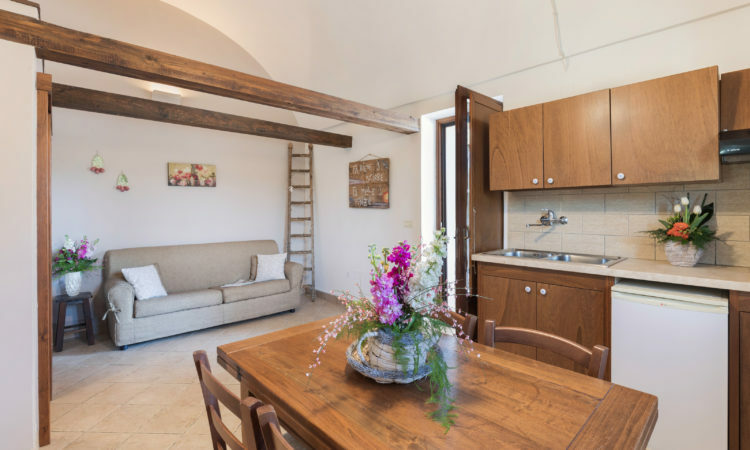 The trullo, originally built by peasants and farmers with stones cropping out in the fields, has become today more refined and comfortable. Unique example of trullo-shaped church, it was built in the Twenties. The plan was drawn by Martino De Leonardis. The church has a Greek-crossed section, while the roof is a typical trullo one, ending with a square-based skylight. The four central pillars support round arches, where the side vaults rest on. The church has been completely restored in 2004. The cult for the two Saints Cosma and Damiano probably started in the small chapel next to the Counts’ mansion, in the 17th century. The believers, deeply devotees of the image kept there, had a copy of it painted and placed on the wooden altar of the little church. This latter was located where now there is the chapel of the Crucified and began to be extended since 1725. The relics of the two Saints were brought from Rome in 1785. The current plan, in neoclassical style, was drawn by the local architect Antonio Curri in 1885. The new façade, made of calcareous stone, is decorated by pilasters and columns. The statues of Sts. Peter and Paul are placed side by side of the pediment. The two bell towers, whose cells end with a squared pyramidal covering, stand out on the upper level. The bronze door has eight bas-relieves portraying the Beatitudes. Located north of the town, behind the church of the “Santi Medici Cosma and Damiano”, it represents the most advanced example of a two-floor trullo. Its coned cupola, about 14 meters high, stands out in the middle of twelve cones. It was built in the first half of 1700 and it belonged to priest Cataldo Perta’s wealthy family. It is composed of 15 connected trulli dating back to the 18th century. The museum shows an exhibition of artifacts concerning the architectural and cultural customs of Alberobello and its history. In Via Monte Nero there is a very old dwelling, built on the rock cropping out of the ground. It has a terraced structure – no windows – whose foundations are huge stones roughly worked. 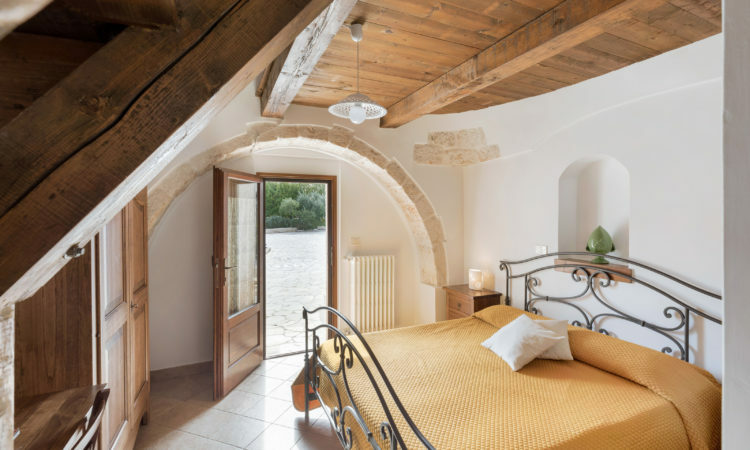 The twin trulli have two entrance doors, overlooking different streets. Even if the rooms are clearly distinct inside, the covering has a saddle-like shape, as the empty space between the cones has been filled up. This feature, completely absent in the recent trulli, confirms the antiquity of the building. The first mayor was elected on June, the 22nd 1797 and this house was the first seat of the newly-formed local government. Casa D’Amore was the first house, too, to be built through the cotto technique, i. e. using mortar and other binding materials (see above) and was named after his owner, Francesco D’Amore. National Monument since 1930, restored in 1955, Casa D’Amore is now the Tourist Information Office. Located in Piazza Ferdinando. One km far from Alberobello, there is the Natural Oasis of Protection of Fauna and Flora consisting in a mixture of oak wood (fragno) and bay oak (roverella) on a hilly area. The forest is an ideal place for walks, picnics and jogging. There are a lot of paths for mountain-bikes and a small park for children. 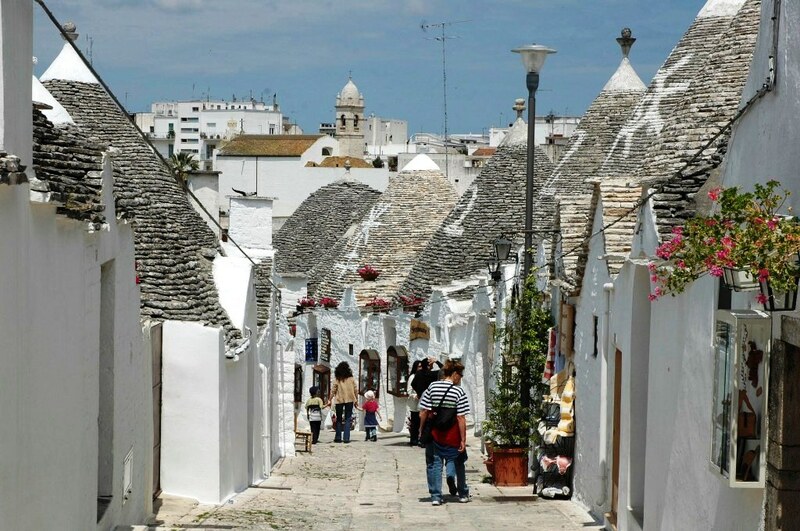 The folk-group will allow you to enjoy and discover the old customs of Alberobello. It performs songs and dances recalling the ones that could be heard after a hard working week on the threshing floor. Come and visit Alberobello during Christmas. In Rione Aia Piccola they perform one of the most charming events in Alberobello, the staging of the Nativity with typical Christmas clothes and dishes.